The Rinnai Sensei Commercial CU160 is a super high efficiency, Commercial Energy Star Certified, tankless hot water heater. The commercial line offers 97% Thermal Efficiency with a heat exchanger built for commercial demands. The CU160 is designed specifically for commercial use with precision engineering to give you an endless supply of hot water. Restaurants and hotels, as well as multi-family dwellings and schools are perfect applications for a commercial tankless water heater. Cascade Logic and Cable Assembly is available for the CU160 tanks. With Cascade Cables used to connect up to 24 water heaters together, Cascade Logic rotates water heater operation to ensure the entire system gets equal usage and functions as a single hot water source. In a commercial installation where you may need to use more than one unit, Rinnai offers many Tankless Rack Systems for installation flexibility as well. The Tankless Rack system is available for wall mounted or freestanding installation for two or more units. The commercial line of tankless water heaters is also available in either Natural Gas or Liquid Propane. The CU160 must be purchased for indoor or outdoor use*. Indoor versus outdoor installation is not interchangeable and must be decided at time of purchase. Indoor installation of the CU160 offers both concentric and PVC/CPVC venting. The dual venting option on the top of the unit allows for maximum installation flexibility - one concentric vent or two PVC/CPVC/PP pipes can be used for venting. With concentric venting, one pipe allows for fresh outside air in, while the other allows for exhaust to go out. Outdoor installation does not require venting. This item, the CU160i, is for indoor installation and requires venting. The Rinnai Sensei Series with condensing technology offers built-in freeze protection down to -22°F on the indoor units. The unit features an integrated check valve located between the turbo fan and the combustion chamber to prevent cold air from entering the venting system and backflow of exhaust in common vent applications. The Fiber Mesh Premix Burner helps to provide even flame distribution for optimal performance for any demand. It features 199,000 BTUs and hot water delivery with a flow rate that ranges from 0.26 - 9.8 GPM. The minimum GPMs is perfect for low demand uses such as shaving, where warm water is needed but not at a high rate! 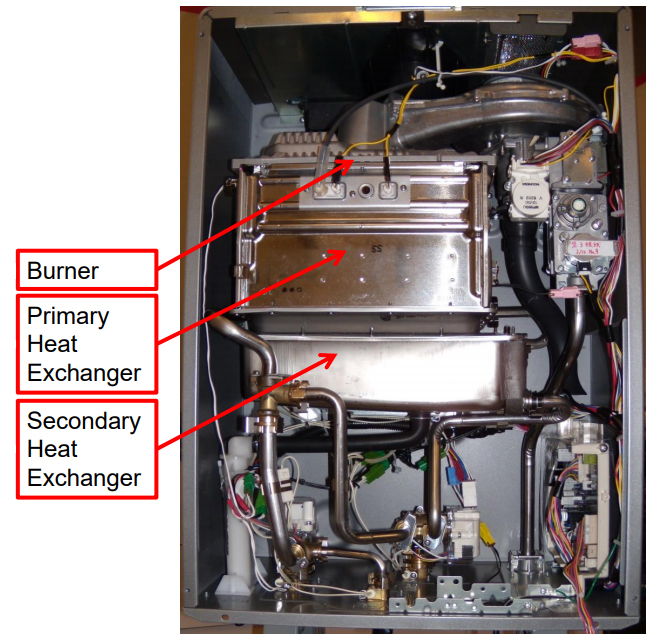 The MCC-91-2US controller is included with the water heater as part of the front panel. The default minimum temperature setting is 98° with a maximum of 140°F. The unit offers a maximum setting of 185°F with parameter adjustment. A parameter adjustment on the CU160 unit can be made for greater hot water flow - up to 11 GPM - as well. In a condensing tankless water heater, such as the CU160, once you turn on the tap, cold water goes into tankless heater and the flame is activated. Water is pre-heated as it passes through the primary stainless steel heat exchanger then continues to be heated as it passes through the coils in the secondary heat exchanger, exits the water heater, into your pipes and up to the fixture calling for the hot water. Depending on the amount of hot water called for, the flame adjusts accordingly to heat more or less water. The CU160 offers WiFi Technology (Control-R WiFi Module, sold separately) for remote monitoring, management. Remote diagnostics and monitoring requires a monitoring dealer. Rinnai service providers can monitor the efficiency of your tankless water heater with WiFi monitoring as well as send you automatic maintenance alerts and possibly offer faster service. The Control-R WiFi Module attaches right to your Rinnai tankless water heater. Simply download the mobile app and you can control your hot water from anywhere. (0" from vent components) 2"
The CU160i offers flexible venting options for installation. Twin Pipe Vent Sizes and Lengths: 2"/ 65 Ft. or 3"/ 150 Ft.
Concentric Vent Sizes and Lengths: 2" x 4"/ 65 Ft. or 3"x 5" / 150 Ft.
*Indoor and Outdoor Installation are specific to the model chosen. CU160iP and CU160iN are for indoor installation and require venting while CU160eP and CU160eN are designed for outdoor installation and venting is not required. Both installation types are available in either Liquid Propane (P) or Natural Gas (N). Certified for installation in Manufactured (Mobile) Homes. To find a local, Rinnai-trained Advanced Comfort Expert that installs Rinnai products in your area click here. Please note Rinnai is adjusting the language in its warranty terms and conditions currently noted in the User Installation manuals. The revised statement will read as follows: "This Limited Warranty applies only to products that are installed in the United States and Canada. Improper installation may void this Limited Warranty. It is recommended that a trained and qualified professional who has attended a Rinnai installation training class complete your installation." All warranties will be honored as written above.